My mother was so patient with me. She started each of us girls when we reached 5th grade. I would sew while she cooked dinner. I was supposed to read the directions, and do the step if I could, then she would come set me straight if I didn’t understand. So, it was pretty painless to learn, but it did take several years. I remember sewing parties with my Grandma, too, where I sat and sewed while she ironed and pinned things together and told me what to do, so we got those projects done fast. I think some of those experiences were the reasons I ended up liking it so much. The machine worked and I had people who set me straight before I had time to get frustrated. For years. what wonderful memories you have with your mom and grandmother. i think if i would have had such pleasant experiences i would be able to sew. great stories, thank you for sharing! You are welcome. I do have wonderful memories. Thank you for helping me remember that with your comment–I was trying to think of why I like to sew and that’s certainly a big part of it. those are very good reasons to enjoy sewing! So cute, Patsy will love it. Thank you. I like the bottom ruffle. I will seem like a whole new pattern to her:). Plus, the cupcakes are a print she will like. I love the nightgown! 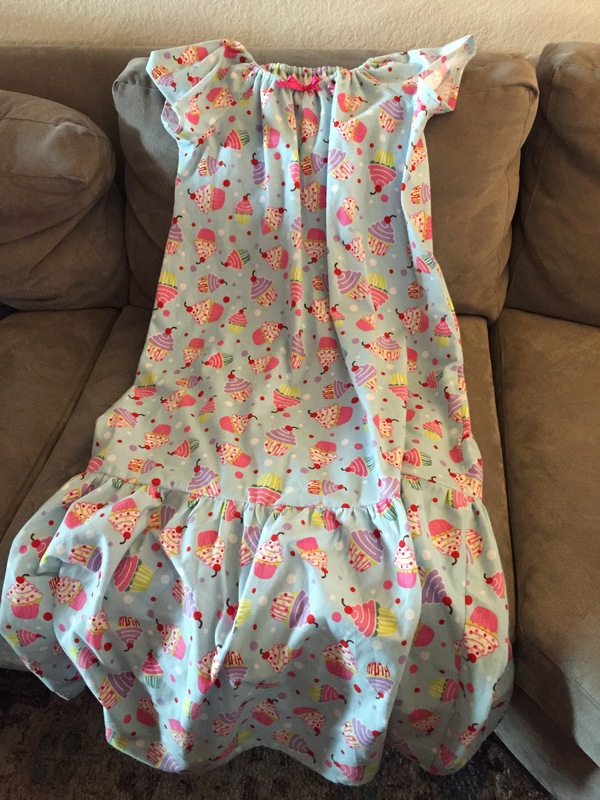 Patsy will be lucky to have such a cozy and cute nightdress. I continue to be in awe of your sewing skills and productivity. Love the fabric. And it looks so comfy. Great story about your mom and Grandma and how they taught you to sew. Sounds like they were great role models. Thinking it’s time for me to start on a crochet project. Crochet sounds like a great idea. I like that, too. I tried knitting but I’m better with the crochet hook. Those are my crafty things to do, especially this time of year. I’m right with you–knitting is not my friend, either! I have that exact pattern!!! I LOVE the nightgown! I’m sure Patsy will absolutely love it! 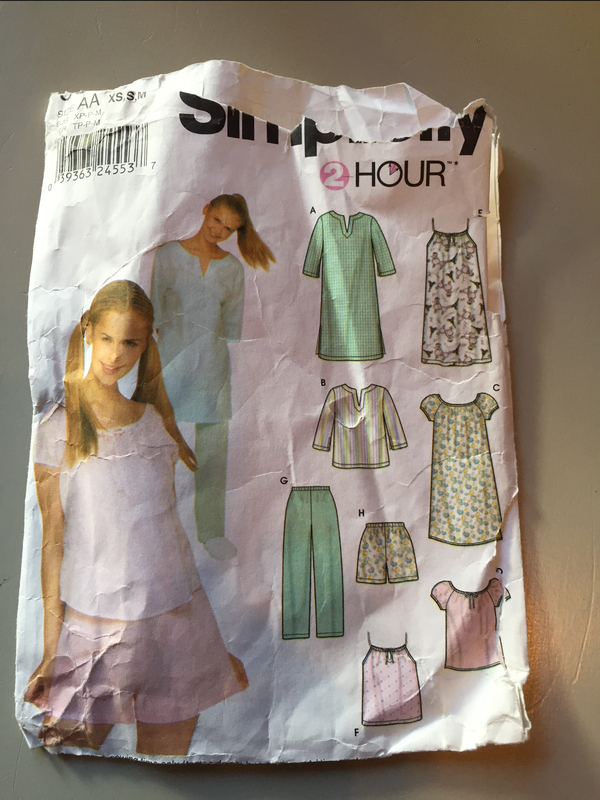 I’ve never used the nightgown pattern only the pants. It’s such an easy pants pattern! I’m going to have to try out the nightgown after I get all settled in my new house! It’s really easy to make! It is rather narrow, though, so depending on how you like your nightgowns, you may want to add a little on the sides, or not. I’ve done it both ways according to the likes/dislikes of the recipient. Also, elastic can be put in the arms, using a casing, but this child likes the arms loose. I hope you are able to settle in to your new house soon. Although there’s nothing comforting about the chaos of moving, I always like the super clean and organized feeling after everything gets put away. You have inspired me. Yesterday I went upstairs (not easy to do) and sat down at my sewing table (after I moved the mending out of the chair) and (then I knocked the spider webs from my machine) and began sewing. It felt good to be sitting there again. I made 5 kitchen washcloths. I had so few I was constantly running out. I need more, but this got me started. The first step is often the hardest. Good luck on your projects. Washcloths are certainly a useful one. That is adorable. There is nothing like comfy cotton flannel. Thank you. It is super soft, for sure! It turned out great ❤️ Nice job.